Welcome to the Wright State University Career and Business Network, a portal for alumni interested in professional networking and career advancement opportunities. 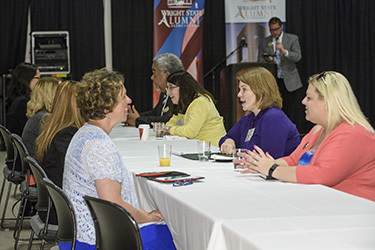 Wright State University Alumni Association strives to help further the careers of fellow alumni, help them achieve their career ambitions and increase the value of their degree. We realize the job search process has changed. To help you stay current, we’ve asked the nation’s top career authors and experts to share tips, tools and best practices you can use to manage your career and job searches. Join your fellow alumni and pick up the skills you will need to build a successful career strategy. Find out more and join the Career Management Community. Through the Wright State Career Center, you can access exclusive job listings, just for Wright State students and alumni. The Career Center connects people with people, and people with resources. Visit the Career Center to search for jobs. The Wright State Alumni Association partners with other institutions around the state to hold alumni-only career fairs in Dayton and Columbus. Please save the date for the following alumni-only career fairs and check our calendar for more information. Join other Raiders who are continuing to build their professional networks. Students reach out to alumni, while alumni reach out to students and fellow alumni. The more connections you make, the greater the opportunity you have to enrich your personal and professional life. Wright State University Alumni: More than 7,500 members.